Deck cleaning is vitally important to the upkeep of your deck. 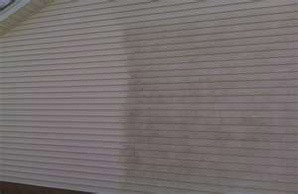 A poorly maintained deck quickly turns grey in color. This is because it deteriorates due to dirt, mold, and algae that gradually tears apart the surface of the wood. Soon splinters form, creating a rougher surface which is more inviting to dirt and grime. Preventing this type of situation is easy if you keep your deck treated with a professional grade deck staining or wood deck sealing product that has been applied properly. But before you purchase a wood sealer from your local home improvement store, you should know that sealing decks is only one part of what it takes to do the job properly. 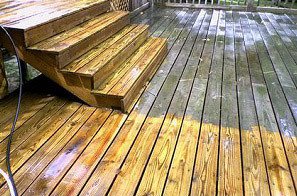 Before deck stains or sealers are applied, the wood needs to be thoroughly washed and cleaned with a pressure cleaner to remove the dirt, grime, and soil that has been imbedded deep into the wood’s grain. For most homeowners (and inexperienced professionals), using a pressure cleaner on wood can be very difficult. It is very easy to damage your deck inadvertently. We will not only restore your deck to like-new condition, but you can rest assured that the work will be done correctly and without the worry of damage, providing for years of future enjoyment. No matter how much effort you put into cleaning your home, stained driveways and walkways will diminish the overall look and take away from the beauty if not cleaned to match. Power washing concrete will add curb appeal to your home and provide a welcome path to your doors. Time to clean up around your pool area? 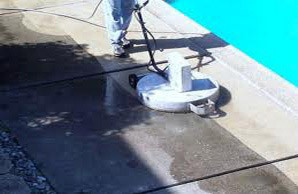 Our pressure washing technicians clean pool decks and other nearby areas to make your pool as clean and inviting as possible. We clean pavers, tile,stamped concrete, or any other surface that surrounds your pool. Our pressure washers can blast away a whole winter’s worth of leaves, bird droppings, grime, dirt, debris, and so much more! It will look great when we’re done! Total Service Pro. ® TM ™, is fully INSURED and fully dedicated to providing the highest level of both power and soft washing services, and is proudly set apart in DRY Carpet Cleaning Services.